ETF growth appears to be hitting the steep part of the “hockey stick” curve. It’s easy to speak in hyperbole when talking ETF growth. Year-after-year, it seems new ETF records are eclipsed and everyone in the industry waves the ETF banner. However, a closer look shows the acceleration of ETF adoption is difficult to exaggerate. 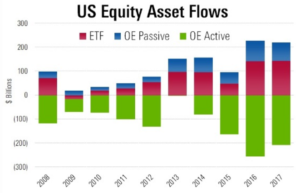 In 2015, ETFs took in $242 billion, just short of the 2014 record $243 billion in inflows. So, actually, a small step back. In 2016, ETFs gained a record $288 billion in new money. Excellent growth, but certainly not an inflection point. Last year? ETFs made a run at a half a trillion dollars in net flows! 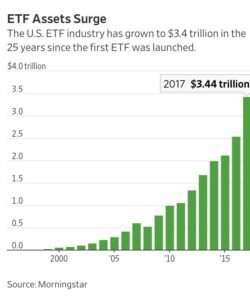 Combined with market performance, U.S. ETFs surpassed $3.4 trillion in total assets. And now, after a record-setting January, ETFs are on pace to obliterate last year’s ridiculous record. While financial market performance has no doubt played a vital role in the quickening pace of ETF growth (and will likely need to continue providing a tailwind this year), investors are showing a clear preference for ETFs. ETFs could challenge the trillion-dollar mark in 2018! It is important to remember ETFs are simply investment vehicles. As was pointed out to me on Twitter yesterday, “ETFs good, mutual funds bad, or the inverse is an overly simplistic way to look at asset management”. I completely agree. Ultimately, investors should evaluate investment vehicles based on underlying strategies, exposure, cost, tax efficiency, performance, etc. Simply accessing strategies and market exposure in an ETF wrapper is obviously no guarantee of investment success. You simply cannot ignore investors voting with their dollars. If they are choosing one investment vehicle over another, there is a reason. Some will say that once the market experiences a meaningful downturn, the trend will change and actively managed mutual funds will be back in favor. We shall see.